Researching keywords can be interesting and fun! The keywords you would think people are using when searching Google (and other search engines) are most likely not what you would guess. So stop guessing today and learn how to find out what terms and phrases people use when searching! – You want to make sure you are using popular terms and phrases in your copy so when people are searching for your products or services they will find your site. – You want to attract the right crowd. If you ever worked with AdWords you know how unwanted traffic can you eat up your budget faster than you can say, “Google took my money!” With organic traffic being “free” you still have to convert the visitor into a customer, so relevant traffic is still important. Be better than most online marketers! Poor keyword research (usually none) is a common mistake, so lets avoid it by spending an extra 5 minutes researching keywords before we start writing. The tool we will use is Google’s Keyword tool, a free keyword research tool that’s part of the Google Adwords control panel. One could think that keyword data is top secret information that Google would not reveal. Not so! Most of the information is readily available in the keyword tool. See Google wants their advertisers to to make relevant ads and target the terms people use when searching. This is great because you can use this keyword data when doing SEO! The search volume – how many searches. Suggestions – discover new search terms. The competition – a rough estimate how many are bidding on the PPC version of the keyword. 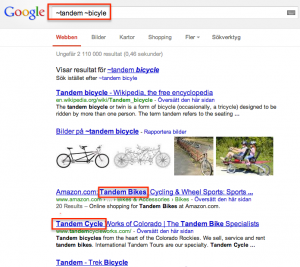 For the purpose of this tutorial I’m going to show you how to keyword research for a fictional page about ” tandem bicycles”. 1. First, write down all possible search terms you can think of (include both singular and plural versions). 2. Open the Keyword Tool in the Adwords “tools” section. If you don’t have an Adwords account, just google “keyword tool external”. Click the first result and enter the captcha code to continue. 3. Enter your keywords / phrases in the text area and check “exact” as “match type”. 4. Hit “search”and examine the results. 5. Examine the keyword suggestions below the results. 6. 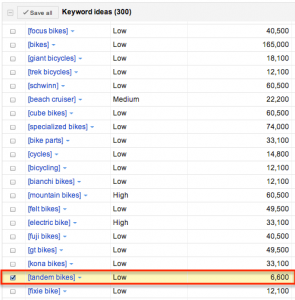 Add the best keyword suggestions to your existing list. You get the idea, group all the search terms you like. Eventually will see what search terms are the better ones. Remember to look in the “Local monthly searches” column. Unless you are selling tandem bikes all over the world, the local column is where you will see how popular a keyword / phrase is. The “local monthly searches” will always be less than the “global monthly searches”. You can see below the difference between UK and USA here. Will give you an idea how many people are bidding on the search term in AdWords. I like to point out, just because a term has “High” as the competition doesn’t necessarily mean it is hard to rank with it. What it does tell you is that people find this term valuable and that they are willing to pay good money for a click. Try searching Google with the tilde sign (~) in front of the search term (a great tip from a colleague and also a wedding photographer in Norway). I can recommend using the free tool at ubersuggest.org. Ubersuggest gives you suggestions based on popular search queries on Google. It works by extracting what Google suggests (as you type), another great way to find long-tail phrases! Another keyword tool, this one from Bing. If you really want to research, compare and dig into keywords, then you should try Bing’s tool. 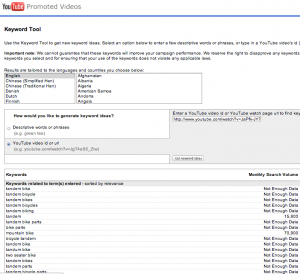 YouTube has its own keyword tool you can use to find the number of monthly searches, get keyword ideas, and even tell you related keywords for a particular YouTube video. Even if you don’t have any videos on YouTube I still recommend you to try this tool! By spending a few extra minutes on keyword research you will have a great advantage over most of your competition! Keep a bookmark handy all the time to “Googles keyword tool” and you will be ready next time you have to put something in writing. Very useful, I’ve never used the Bing or YouTube tools, but I’m familiar with Google’s to a small degree. I’ve considered PPC, but my site is still young and I’m not sure how much ROI I would get. At the moment, my keyword research still revolves around search volumes, but I think that may change when co-occurrence becomes a much more important factor. Yes I am sure things will change in the future regarding keyword research. Anyways, try AdWords advertising, it cost little money, but if it doesn’t give you more in return you’ll notice it quickly and you’ll be able pause those campaigns. Keyword research is even more important with PPC so you don’t burn your money and get bad quality scores. Thanks for the comment! Is it possible that using a “~” only works with some and not all languages? Great post, very easy to follow! Could be, try different searches see if you get different results with or without the tilde sign. Let me know how the result is.